Save an extra CDN$ 5.23 (37%). Buy the Kindle Edition instead. Lea Clark is all set for an animal-discovery adventure! She's never been to a rainforest before, and her mind is filled with exciting thoughts about the animals she'll get to see - and the pictures she'll get to take deep in the jungle. During a hike with her brother through the Amazon rainforest, they discover a baby sloth that is badly injured. Lea quickly decides she must do all she can to help the little sloth survive. But as she learns more, she wonders: "Is that the right thing to do?" Start reading Lea Leads the Way on your Kindle in under a minute. 5.0 out of 5 stars6-year old approved! My 6-year old daughter LOVED these books! There are 3 in the series and we've read the first 2. They're great for adventurous girls because the main character goes ocean swimming, hiking, and loves photography. My daughter loves all those things! It's also great because it takes place in South America, giving my daughter a bigger picture of the world. My seven year old daughter loves all things Lea Clark but especially the books. 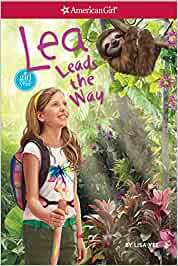 I read this one too and it was a very cute story that discussed safety, responsibility for animals and our planet, and travel. i got this book and read it all day long.then my 10 year old read it and loved it even more.she even read it to her american girl Lea.LOVE LOVE LOVE. Very nice stories for young girls.